The U.S. Fish and Wildlife Service this week protected Arizona’s Sonoyta mud turtle, a Hawaiian bird known as the ‘i’iwi and a Southeast fish called the pearl darter under the Endangered Species Act. Today’s action came in response to two 2011 settlement agreements with the Center for Biological Diversity and WildEarth Guardians under which the Fish and Wildlife Service made protection decisions for hundreds of vulnerable species over the past six years. With these three newly designated species, 188 species have been protected as threatened or endangered under the agreement. Eleven additional species have been proposed for protection and await decisions expected by the end of the year. With webbed feet and an innate ability to swim, the Sonoyta mud turtle has evolved to be highly aquatic in one of the driest parts of the Sonoran Desert. The turtle is found only in a small area of Pima County, Arizona and Sonora, Mexico. Diversion of surface water and pumping of groundwater have led to the loss of much of this habitat, which the turtle needs to survive. In the United States, the turtle has been reduced to a single reservoir called Quitobaquito Springs within Organ Pipe Cactus National Monument. Four populations are currently known in Mexico, but the loss of the turtle has already been reported from an additional site. At all of these sites the number of turtles has declined as aquatic habitat has been reduced. It has been waiting for protection on the candidate list for 20 years. 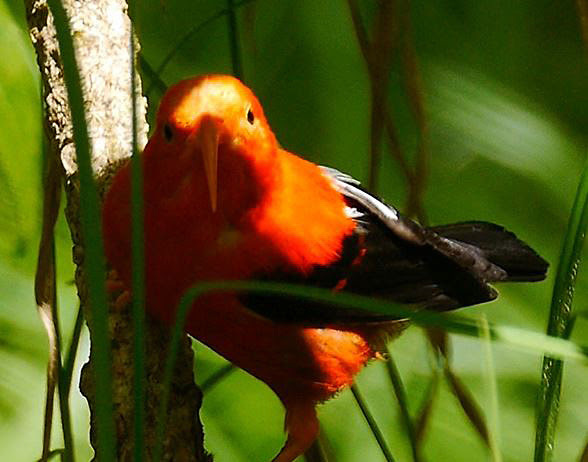 The ‘i‘iwi — also known as the scarlet honeycreeper — is a medium-sized honeycreeper that lives in native forests of ohia and koa. The ‘i‘iwi was once widespread throughout the Hawaiian Islands, but the species is now primarily restricted to high-elevation areas on the Big Island, Maui and Kauai because of habitat destruction and the spread of avian pox and malaria by mosquitoes, which were introduced to the islands. The ‘i‘iwi has survived at high elevations, primarily over 3,600 feet, because it is too cold there for mosquitoes and the deadly diseases they spread. But with climate change, mosquitoes are moving uphill and are predicted to cover most remaining ‘i‘iwi habitat as the climate continues to warm. The ‘i‘iwi has seen a 92 percent decline on Kauai in the past 25 years and a 34 percent decline on Maui. The Center petitioned for its protection in 2010. The pearl darter once swam in hundreds of miles of river in Mississippi and Louisiana, but today has been reduced to scattered populations in a fraction of its range. It has been lost from its namesake, the Pearl River. The darter is threatened by water pollution from oil and gas development, sand and gravel mining, urbanization, agriculture and the proposed damming of Little and Big Cedar creeks, tributaries to the Pascagoula River. Other threats include climate change and hurricanes and similarly catastrophic events. The Southeastern Fishes Council named the pearl darter as one of the 12 most endangered fish in the southeastern United States. It has been waiting for protection on the candidate list since 1991. Photo by Brett Hartl, Center for Biological Diversity. The Center for Biological Diversity is a national, nonprofit conservation organization with 1.5 million members and online activists dedicated to the protection of endangered species and wild places.